Dubai: The Dubai Land Department (DLD) has started auctioning freehold properties forfeited from defaulters. In a first major auction, five properties in The Springs and Jumeirah Islands were sold on November 28. Humaid Omran Al Shamsi, Head of Auctions, DLD, told XPRESS: "We are auctioning freehold properties in Dubai. Some of these have been mortgaged to banks. The auctions are a way to clear the market. These properties come through Dubai courts for auction and the proceeds go back to the courts. They have a process in place to return it to the banks." Out of the five properties that went under the hammer on November 28, four were sold higher than the base price. A two-bedroom 1,800-square-feet Springs villa went for Dh1.306 million against a base price of Dh1.1 million. Indian businessman Vimal Bansal, who bought it said: "This property is for my personal use and since I felt the price was right, I successfully bid on it." A 3,511-square-foot three-bedroom (Type 3E) villa in Springs 11, with a partial lake view, was sold for Dh1.82 million against a base price of Dh1.5 million. The most surprising bid was for a 10,637-square-foot four-bedroom villa with a separate study room in Jumeirah Islands. It went for Dh5.4 million against a base price of Dh3.5 million. "This is a good property in a good location and hence it went for such a high bid. We will be re-selling the property as soon as we get the papers," said buyer Amar S. Dhir of Castles Plaza Real Estate. More auctions are expected in the coming months. 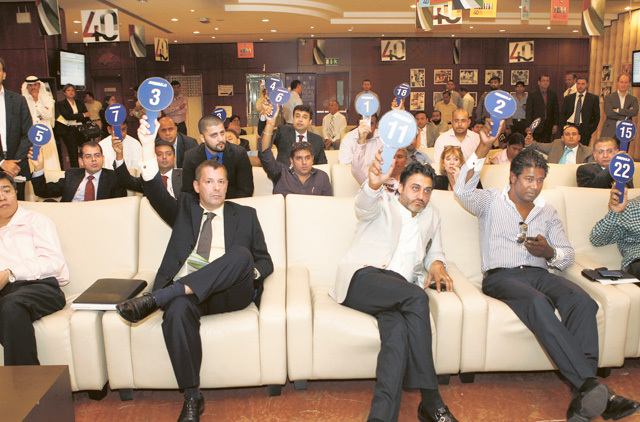 Al Shamsi said: "All buyers from the auction will get title deeds along with related documents. Ludmila Yamalova, Managing Partner, HPL Yamalova & Plewka, said: "The properties being auctioned have been passed by the courts. This means that the docket of defaulting properties is finally starting to clear. If that is the case, it is a positive development." Sundar Parthasarathy, Executive Vice President, Head-Consumer Assets, Consumer Banking Group, Abu Dhabi Commercial Bank (ADCB), said: "On November 28, we auctioned a property at the Land Department. There are a few properties repossessed by ADCB that are being lined up with the Land Department for auction. The DLD public auction is a welcome step for all UAE banks. This will instil better confidence in the mortgage market and give rise to structured lending practices. The proceeds from the auction will be applied to offset the loan outstanding, including charges, and provisions reversed."